Kennels has bred or trained for lives of significance and service. What a difference a year makes! This is one of the 45 Dutch Shepherd Police K-9s Cher Car Kennels has been privileged to produce since we began breeding Dutch Shepherds in 2005. What a beautiful cover girl! This Harrisburg (PA) Police Department K-9 “Zoe” from our Cher Car Kennels Dutch Shepherd litter born 12/26/2014 out of Becker and Zuster. K-9 “Blitz” from the Jasonville Police Department during National Night Out festivities in Indiana. (Blitz is a Cher Car Kennels Dutch Shepherd from our 2013 Lothar x Luna litter.) Thanks for sharing Kenna Duguay! Vermont State Police K-9 "Tori" is a Cher Car Kennels bred Dutch Shepherd from our 2013 Lothar x Cayenne litter. Congratulations to Leslie Kucinskas and her Dutch Shepherd “Meela” (CHER CAR’S DUCHESS OF WOODLAND COURT SPOT on receiving National Certification from the NSDA-National Search Dog Alliance in “Area w/live subject and large source cadaver”. To obtain this qualification, the Area Search K-9 team (handler K-9) must successfully search an eighty (80) acre wilderness area within a two (2) hour period and locate one (1) hidden subject and one (1) concealed cadaver source. Leslie and Meela belong to MiSAR-Michigan Search and Rescue which serves Michigan and the Great Lakes Region. Leslie and “Meela” qualified as a Deployable Search Team with MiSAR earlier this year, and by now receiving this new national certification, they rank amongst the best. Mid-Michigan Police K9 is very proud of the Eastern Michigan University Explosive Detection K9 Team of “Nitro” and Bridget Bofysil. This team took 2nd place at the Region 19 Explosive Detection trials with the United States Police Canine Association (USPCA) this last week. Bridgette and Nitro are Mid-Michigan Police K9 graduates!! Great job guys!!! Dutch Shepherds K-9 "Chase" and K-9 "Ryker" from Cher Car Kennels breeding (Becker x Zuster and Lothar x Nada). Police K-9 "Jonah" of the Orleans County Vermont Sheriff's Department is from our Cher Car Kennels Dutch Shepherd litter out of Lothar and Cayenne born 8/14/2014. What a handsome guy! Police K-9 "JONAH" of the Orleans County (VT) Sheriff's Dept is out of our Lothar x Cayenne Aug 2014 litter. Meela says "I found him!" "Come on! Hurry and get up here!!" "Meela" is a Dutch Shepherd from our 2014 Becker x Zuster litter and is certified through MiSAR-Michigan Search & Rescue. This is "Hunter" (Multi-HIT RBIS URO3 CH AHD SC AN PTE CHER CAR�S STRZALKOWSKI ) and his owner Teri (the woman who wrote the post to the left). Besides being her service dog, Hunter also competes in various performance events. The picture above is of Teri and Hunter being awarded one of his HIGH-IN-TRIAL ribbons. Christmas 2017 picture of Vermont State Police K-9 "Tori" from our Lothar x Cayenne 2013 Dutch Shepherd litter. And so it begins. This Dutch Shepherd puppy is from our 2017 Ledger x Xis litter. German Shepherd �Stryker� from our Kevlar x Mahruka June 2016 litter. Kewaunee WI Police Officer Brian Gale and K9 �Charlie� came down to Cher Car Kennels to recertify in narcotics, tracking and patrol. Of course he passed with flying colors! What an outstanding team they are. German Shepherds �Kona� (Kevlar x Frieda July 2013 litter) and �Stryker� (Kevlar x Mahruka June 2016 litter). "BUTTERS" from the May 2016 Lothar x Luna litter. Osceola County Sheriff's K-9 Unit photo showing Dutch Shepherd K-9 “Chase” (from our 2014 Becker x Zuster litter) and Dutch Shepherd K-9 “Ryker" ( from our 2015 Lothar x Nada litter). Officer Helms and K-9 Duke at August 2, 2017 "National Night Out" event in St. Johns. Duke is a Dutch Shepherd from our 2010 Touche x Rush litter. Hearing Alert dog "Sissy" is out of Lothar x Snap. Cheboygen County MI K-9 Havok all grown up! Havok is from our 2015 Dutch Shepherd litter of Lothar and Snap. PSD K-9 Havoc is out of Lothar x Snap. PSD K-9 Ares is out of Lothar x Luna. His handler writes "Ares-Cher Car's God of War always finds a way to impress me with his abilities. Still training but a force to be reckoned with at 11months." Dutch Shepherd "Remington" (from our Becker x Zuster 2014 litter) is an Autism Spectrum Disorder (ASD) Dog in Plainfield, Illinois. SAR K-9 "Meela" is out of Becker x Zuster. PSD K-9 "RYKER" is out of Lothar x Nada. PSD K-9 "TORI" is out of Lothar x Cayenne. PSD K-9 "JONAH" of the Orleans County (VT) Sheriff's Department is out of Lothar x Cayenne. PSD K-9 "BLUE" of the Evart (MI) Police Department is out of Lothar x Luna. PSD K-9 "NITRO" of the Eastern Michigan University Police Department is out of the Belgian Malinois Mako x Tega April 2014 litter. Rhode Island K9 "ARES" is out of Lothar x Luna. MOUNT GREENWOOD — Doctor McDog visited what will soon be his office at 3301 W. 111th St. in Mount Greenwood for the first time Tuesday. Commonly known as "Doc," the Dutch Shepherd will eventually be used during therapy sessions at Begin Within Therapy Services Inc., owner and therapist Kathleen McShane said. She launched a fundraiser July 22 to bring a therapy/psychiatric service dog to her practice on the Far Southwest Side. "He's doing basic obedience training now because he is just a puppy," McShane said as the big-eyed pup sat beside her feet. The online fundraiser had collected $7,607 from 68 donors as of Tuesday morning. The full price of the dog is $12,500, as Doc requires a year of intense training with Minnesota-based Argos K9 before joining the staff, McShane said. Therapy/psychiatric service dogs are trained to detect anxiety, sadness and a range of other emotions, she said in a previous interview. The dogs respond to these emotions with simple gestures such as sitting at the feet of an angry adult to de-escalate a tense situation or lending a sympathetic ear to child as he or she talks through a difficult incident. Although not fully trained, Doc showed a bit of his potential Tuesday, as one reluctant teen eagerly agreed to a therapy session in order to meet the puppy. Another child spoke about several issues while petting the dog the whole time. "Being with animals actually releases a hormone, oxytocin, which creates warm feelings," McShane said. She hopes to raise the rest of the money for Doc's training by March 2018. Several corporate sponsors have already stepped up to the plate, including Beverly Hills Animal Hospital, Beverly Bank and others. Doc visited the dog-friendly bank at 10258 S. Western Ave. in Beverly on Tuesday and was given a bone by a teller. Eventually McShane plans to make Doc a fixture at community events as well as hospitals, retirement homes, schools and other places where his skills will be put to use. Doc was born Oct. 14 at Cher Car Kennels in St. Johns, Mich.. He spent the first eight weeks with the breeder who paid close attention to his temperament before approving his training at Argos K9, McShane said. After a month in Minnesota, Doc was given the green light to visit Chicago for two weeks. He's splitting his time here between McShane's office in Mount Greenwood and her home in Beverly. Then he'll return for more training, while continuing to visit and for longer stints. McShane hopes his training will be complete by April 2018. Once he becomes a full-time fixture at the office, all of the therapists will be trained on how to best use Doc's unique talents. This is not the first non-traditional approach to therapy for McShane's practice, which boasts six therapists as well as a pair of yoga instructors and a massage therapist — both of whom use their skills to treat patients. And as for the dog's name, Doc was chosen through an online poll where donors were allowed to vote in exchange for their support. Other options included Montana, Gus, Harry and Conry — a Gaelic name meaning, "King of All Hounds." McShane said Doc's coloring is a bit unusual too, as most Dutch Shepherds have darker features. But as of now, only the dog's tail carries a touch of black fur. "His tail looks like it has been dipped in an inkwell," she said. PSD K-9 "JONAH" of the Orleans County (VT) Sheriff's Dept is out of Lothar x Cayenne. Officer Brian Gale of the City of Kewaunee Police Department has been here at Cher Car Kennels for over a week now training with GSD “Charlie”. I tagged along yesterday on their road trip from Grand Ledge to Lansing as they did a meet and greet at an Ice Cream stand, sniffed out narcotics in a hair salon (amongst ALL those pungent odors of hair dye, perm chemicals, shampoo, hair spray, etc.) then tracked a simulated bad guy from the business they pretended to rob to a home hiding place. What fun! Future service dog �Stryker� from our German Shepherd Kevlar x Mahruka June 2016 litter. Today is Zoe's first birthday! Zoe (Cher Car Kennels and Allen Animal Hospital), sponsored by Merial, is a very driven and focused dog. As much as she loves to work, she's also a very affectionate girl. All in a day's work for another Cher Car Kennels Dutch Shepherd. Congratulations to Jasonville Indiana Police Officer Andrew Duguay and his K-9 partner Blitz on a job well done! 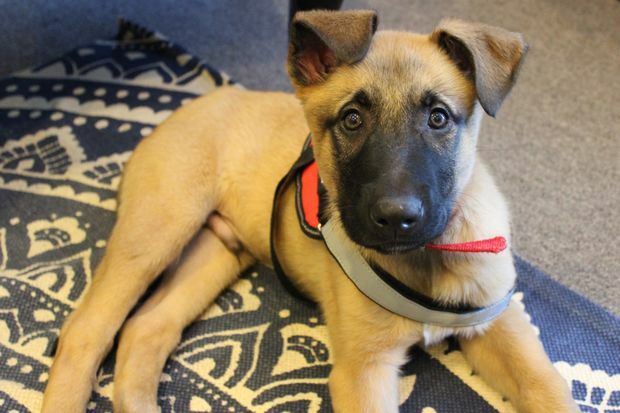 Eastern Michigan University Police Department has a new member - Nitro. 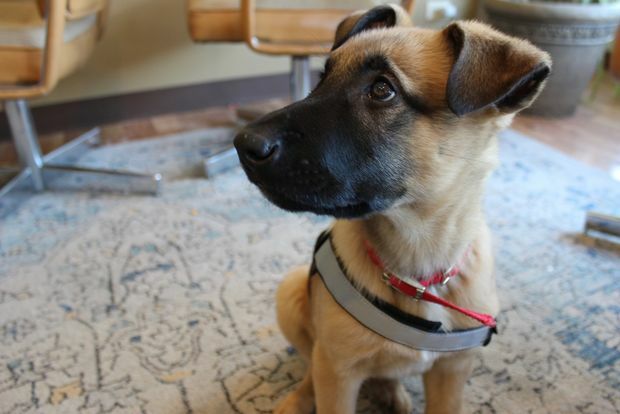 Nitro is a one year and a half old Belgian Malinois. Officer Bridget Bofysil joined the EMUPD in March 2014. She proposed the K-9 unit soon after. In October this year, Nitro arrived on campus after attending a 5-week training session at the Mid-Michigan Kennels to learn to track and find explosives. "Most of the students love Nitro," said Bofysil. "He is super high energy, but when he meets new people, he is super calm and nice." "He is an explosive detection dog, so it brings a lot of safety to campus and the surrounding areas. Another aspect is he is a crime deterrent. People are less likely to fight with a police officer or fight each other when a police dog is around." said Bofysil. PSD K9s Jonah and Tori are brother and sister! I want to give a huge thanks Deputy Harvey Holt, Officer Andrew Duguay, and Trooper Klun for putting on a fantastic K9 show for the girl scouts today!! Welcome Dylan! Dylan joined our family this week from Cher Car Kennels. The donation from Cher Car was made with support from Lori Hoener and the Sandy Engel Fund, which honors the memory of her mother. Vermont State Police K-9 "Tori" and Orleans County K9 "Jonah" (pictured below) very successfully competed at the Green Mountain Iron Dog. Trooper Roos and K9 "Tori" came in 1st place in their division and 2nd over all!! The Cheboygan County Board of Commissioners was introduced to the newest addition to the Cheboygan County Sheriff’s Department at its meeting Tuesday. Havoc, who will be replacing Taser when he retires from the sheriff’s department K9 unit, was on his best behavior during his visit before the board. 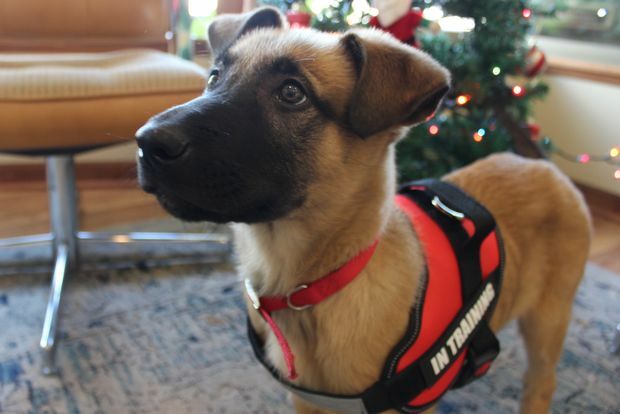 Havoc is a Dutch Shepherd, which is a little different than Taser who is a German Shepherd. Havoc is currently around 10-weeks-old. Over the course of the next year, LaCross will work with Havoc to give him the training the puppy he will need to be part of the K9 unit. “Work him in, get him trained in narcotics and tracking and everything else that Taser is currently trained in,” said LaCross. Since LaCross traveled downstate and purchased Havoc, the two have been working on the basic command skills and socialization. He is still in his puppy years and has some training to go through before he can take Taser’s place. It is the intention to have Havoc trained and certified by the time he is approximately a year old. When he is fully grown, Havoc is anticipated to be around 75 pounds. He is already growing fast. Over the last three weeks that LaCross has had him, he has gained between 5 and 6 pounds. By the time Taser is ready to retire, it is expected that Havoc will have been trained and certified and will be ready to take his place. Although Taser is still very healthy and doing his job well, he is starting to get older. The average age for a K9 unit is 7-years-old and Taser turned 10 in May. He was around 1 1/2-years -old when he came to the Cheboygan County Sheriff’s Department and was around 90 percent trained. Because LaCross has worked with Taser over the last nine years, getting familiar with the training, he will be taking over a lot of the early training for Havoc. He will also rely on the trainer who initially trained Taser to give him guidelines and help him through the process of getting Havoc certified. LaCross will also be taking Havoc into the schools throughout the county periodically so as the children grow up and go through school, the dog will visit them at least once a year, to let them grow together. Cher Car Kennels is very proud to share the wonderful news that Nick Ackerman's service dog "Troy" was awarded a Certificate of Honor by the American Kennel Club Humane Fund Awards for Canine Excellence committee in recognition of the assistance work he performs for Nick. What an honor! Cher Car Kennels is humbled and complimented by this lovely review by Marisa Watson posted to our facebook page on July 10, 2015. "I absolutely adore how much you care for your animals. Your kennel should be the standard that all other breeders strive to emulate. Great work and beautiful dogs." K9 (Ryker) and I working the 4th of July detail in Evart, Michigan. Dutch Shepherd K9 Ryker is a Lothar x Nada son from their 2015 litter. Dutch Shepherd K9 Tori is a Lothar x Cayenne daughter from their 2013 litter. Dutch Shepherd K9 Dash is from our first Touche x Rush littter of 2007. Deputy Tyler Jacobs, K9 Jonah & VSP Sgt. Sean Selby at Derby Elementary School. Dutch Shepherd K9 Jonah is a Lothar x Cayenne son from their 2014 litter. GRAND RAPIDS (WZZM) - A Forest Hills teen whose new service dog died suddenly from cancer, is gaining his independence... with a new dog. Adjunct Trainer and Foster Dad Bob Doughtery teaches Zoe balance and control on an elevated dog walk. Zoe was donated by Cher Car Kennels and Allen Animal Hospital. Photos by volunteer Tracy Darling. Osceola County, Michigan Sheriff's Department Deputy Jed Avery and Deputy Mark Moore with their future PSD K9 Dutch Shepherd puppies and breeder Cheryl Carlson of Cher Car Kennels. Two puppies are learning the ropes of police work from two veteran K9 officers in Osceola County. The two rookie K9's, Ryker and Chase, are in training with their handlers and are also getting some help from their older counterparts. K9 Chase is a 5-month-old Dutch Shepherd being trained by Sgt. Mark Moore. K9 Ryker a 9-week-old Dutch Shepherd is being trained by Deputy Jed Avery. The Osceola County Sheriff's Office purchased the dogs with the help of fundraisers and donations throughout the past eight years. 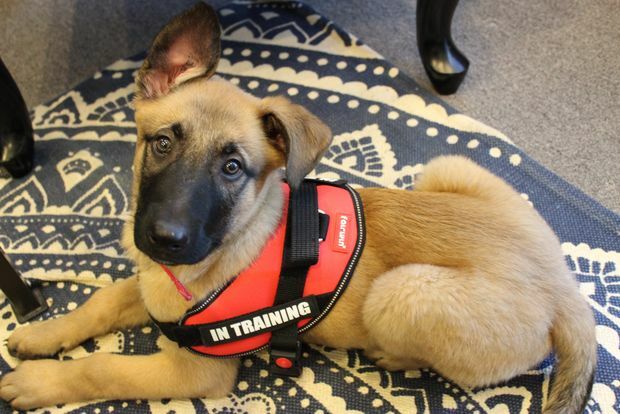 The department is saving money by training the dogs as puppies. The two older K9 officers will be retiring next year so they are helping get their replacements up to speed. Deputy Avery has worked alongside 10-year-old K9 Bary for more than 8 years. K9 Bary is helping get K9 Ryker acclimated on the job, starting with getting used to being in the patrol cars. "We are doing more than police training, everything is new to them," explained Deputy Avery. "Every noise and obstacle is so new to them, so we are desensitizing them to the environment. They pick up quite a bit by just watching the other dogs." K9 Bary is a dual purpose explosive dog, but both of the new K9's will be trained in narcotics detection. Sgt. Moore trained his first police dog, K9 Justice, a narcotics detection dog, who will be eleven years old this year. Sgt. Moore works nights with K9 Justice and the new trainee K9 Chase. With K9 Ryker also being trained as a narcotics dog, the Osceola County Sheriff's Office will be able to have 24-hour K9 coverage for narcotics. The goal is to have the puppies trained for the beat by 9-months-old. Along with individual work, the puppies train in a larger group twice a month. If you want to see training updates you can follow two of the K9 cops on their own twitter accounts: K9 Ryker Twitter and K9 Bary Twitter. MORRICE POLICE has a new K-9 officer, Reggie, to help Chief Matt Balsley. The two played together Wednesday outside of Morrice Elementary School. MORRICE, MICHIGAN — A Morrice Police Officer currently in training may only weigh 75 pounds, but with his black coat of fur and eyes that seem to stare straight through anyone, he is sure to strike fear into the heart of any criminal. That’s because Reggie, who lives and trains with Chief Matt Balsley, is a K-9 officer, believed to be the first in the history of the force. A 2-year-old Dutch Shepherd, Reggie has been training as a National Association of Professional Canine Handlers (NAPCH) certified dog in areas of narcotics detection, tracking and handler protection at Cher Car Kennels in St. Johns. That means in addition to finding people — particularly children and the elderly — who have gone missing and looking out for his handler in times of crisis, Reggie will be able to find illegal drugs, wherever they may be. The last one in particular is a skill that Morrice Area Schools Superintendent William Heath took sharp notice of, to the point where the school district is paying a portion of Balsley’s salary, in part to bring the dog on school grounds. Reggie also helps Balsley get acquainted with the junior and elementary school students, in as much as the younger children like to pet Reggie and watch him play fetch. Reggie is expected to complete the narcotics detection portion of his training by the end of the month, with other areas soon to follow. In the meantime, he’s been making the rounds at local area schools, entertaining children and adults alike. Prior to coming to Morrice, Reggie was a champion show dog and lived at Cher Car Kennels in St. Johns. Balsley pointed out that in addition to receiving narcotics detection, tracking and patrol dog training from Reggie’s breeder Cheryl Carlson of Cher Car Kennels, he receives support from Bancroft Veterinary Clinic, Morrice pet food supplier Meal and More and people from around the neighborhood. Solon McGill’s Dutch Shepherd “Izzy” from Cher Car Kennels is a certified HRD cadaver dog who recently played a key role in the arrest and conviction of Mark Bucki in the murder of his wife, Anita. Because her body was found at a different location two weeks after her murder and the suspect had spent an entire day cleaning up before reporting his wife missing, Izzy's ability to locate the odor of human decomposition in key locations was important for the prosecution. Butch Brancheau of the Shiawassee County Sheriff's Department in Corunna, Michigan with his future PSD K9 "Vader"
April 18, 2013 - Cher Car’s Princess Isabella aka "Izzy" (Snap and Dodger) received her certification in human remains detection (Cadaver K9) through the National Narcotic Detector Dog Association (NNDDA) this past week. It’s been about a year since we picked up Chamberlain. He was born December 22, 2011 (Cher Car’s Full Metal Jacket “Kevlar” x Cher Car’s Casino’s Shadow aka “Shadow”). It was very obvious to us from observation and results, that during the first seven weeks of his life he received a lot of love and attention from his mother and you and your kennel staff, which gave him a wonderful introduction to the world of people. I am disappointed that I did not print your description of this litter when announcing their availability for purchase. As you have proven to me over the last 30 years, you know your dogs and the characteristics you breed for. To paraphrase your litter announcement: “These puppies will be smart, people friendly, active, with you and there when you need him”. Bullseye!!! As we discussed, December 2011 we lost Bobby Lee (Cher Car’s A Shout in the Woods aka “Timber” x Cher Car’s Rock n Roll aka “Roxy”). He was 10 years old and my working K-9 partner for over 6 years. Of the five dogs I have had from you (my two sons also had two dogs each) he was truly great and I thought would be impossible to replace. Not only is Chamberlain as advertised, he has exceeded my high expectations of your dogs. He is extremely smart, communicative, loves people, always there when you need him. Though I am now retired, after 6 months of K-9 training, Chamberlain is significantly ahead of all my previous dogs in his development. He is truly outstanding. All your dogs have been warm and loving, but I have never had a dog who wants always to be with you and there for you. Usually Shepherds want to be close but at a distance. This dog loves constant contact and interaction. In K-9 training his bite is unbelievable and he hits like a train, additionally his obedience is flawless. With Chamberlain I had the pick of the litter, but I don’t think you could go wrong with any of the pups. A few weeks after I picked up Chamberlain, a client had to return one of Chamberlains brothers because he was a little too active and you put him up for adoption. I am still kicking myself for not taking advantage of that unfortunate situation. This is a great dog. I strongly encourage you to continue development of this fine line of dogs. St. Johns Police Department Officer Helms rewarding K-9 Duke for a job well done. (See citation below.). When MSU police Sgt. Dan Munford opened the door to his K-9 partner’s crate, Zilla, his black brindle Dutch Shepherd, came to life. “Zilla is like a tornado going through a small town — she’s got a whole lot of energy,” Munford said of his K-9 partner, with whom he’s only been working for about two months. Zilla might have the playfulness of a puppy, but she was on a mission: looking for bombs on university property — jars of TNT, C-4 and dynamite. Six pairs of officers and dogs make up the Michigan State University Police K-9 Unit. On Wednesday, they held an eight-hour training session, which took place at various locations across campus including an old Engineering Research Complex on Hulett Road. Although Zilla is new, she’s catching on quickly. She and Munford had a bonding moment Monday when they brought down their first assailant together — a man involved in a domestic assault and malicious destruction of property in Bath Township. His dog might be young — she will turn two years old soon — but Munford is far from new to the K-9 unit world. Zilla is his third dog with the program, and he has been a member of the MSU Police K-9 Unit for about 15 years. The session is one of two the pair participates in each month, where officers train the dogs by conducting article searches, aggression work, explosive searches and indoor narcotics work. The training session also is a chance for all of the officers to be together and work on perfecting specific skills the dogs might be struggling with. “What’s neat about the K-9 Unit and all K-9 units in general is there is a kind of different philosophy where everybody just wants to make their dog as good as they can make their dog,” said MSU police Officer Adam Atkinson, who also attended Wednesday’s training. Like any new couple, Munford said it’s just a matter of time until he gets used to the quirks that make Zilla, Zilla. Chief Michael Madden placed into service a canine program for the St. Johns Police Department last Friday 6/6/2012, and introduced Dutch Shepherd “Duke” with his K-9 handler Officer Ben Helms. Chief Madden extended special thanks to Cher Car Kennels of St. Johns, especially owner Cheryl Carlson. “This program would not be happening if not for the extreme generosity of Cheryl”, stated Chief Madden. “They not only donated the dog but also the training, a value of $11,000! We are fortunate that one of the most highly respected Police Dog trainers in the Midwest is located here in St. Johns”, states Madden. “Ms. Carlson is one of the best know experts in the industry.” She has been training and breeding dogs professionally since 1977, and instituted the Police K-9 units for the MSU Police, Ingham County Sheriff Department, East Lansing Police Department, Eaton County Sheriff Department and the Lansing Police Department, among others. Cheryl has trained and certified over fifty (50) police K-9’s from the ground up, many of her own breeding. The Dutch Shepherd, named “Duke” was bred by Cher Car Kennels and has been trained in narcotics detection. Madden stated, “that drug abuse and trafficking have been steadily increasing in the St. Johns area for the past several years. Having a K-9 unit will deter drug use and catch drug dealers that frequent St. Johns”. In addition to narcotics detection, Duke will be trained in tracking and apprehension. He will be able to do building searches, track lost subjects or criminals evading arrest, and protect his handler from physical harm. Officer Ben Helms, the K-9 handler for Duke, has also received extensive training. Duke will be available for school and service club visits this fall. Izzy (Snap x Dodger) doing cadaver training, finding submerged remains in moving water. I just wanted to drop you a line and let you know how well Bajah is doing. She is an unbelievably fast learner. Bajah is currently certified through NAPCH for obedience, tracking, narcotics, article search and area search. The only areas that she has not certified in are building search (should have it soon), aggression and aggression control. I have started some of the bite work; however, I am not pushing it until she matures a little more. She is already a flyer on the aggression field. NAPCH holds their national workshop in Alpena every year and I had a couple master trainers tell me that she is the best female for her age that they have ever seen. So I just wanted to let you know that you did a great job with the breeding. I'll send pics soon. Deputy Matt Duff and K-9 "Bajah" (a Touché x LaBelle Dutch Shepherd puppy born 1/12/2010). Bajah received certification through NAPCH for obedience, narcotics, tracking, article search and area search in October 2010 (when only 9 months old!) and just received certification in aggression and aggression control in October 2011 (at 21 months of age). Bajah is Deputy Duff�s working patrol dog for the Hillsdale County Sheriff Department. We are pleased to report that our two police dog prospects were acquired by the Virginia Department of Corrections. Both dogs are now on their way to a fulfilling career in the prison system! Back in Feb. 2006 I bought a Belgian Malinois (Male) from you. He has been a great dog. As you may remember I am a Sheriff's Officer with the Atlantic County Sheriff's Office here in New Jersey. This past April he and I started the Police K-9 Academy. We are training to work as a Patrol and Arson Team. We have seven weeks left in the patrol phase of training and will be starting the Arson phase in Sept. of this year. I have attached some photos of my house pet turned K-9. This is service dog "Piper" with her owner/handler Kevin Fritz of Allentown, PA. Kevin is attending school at the University of Illinois in Champaign-Urbana, and had contacted Cher Car Kennels to train a service dog to his specifications. Needless to say, "Piper" the Papillion was a delight to have with us during training! This picture of "Piper" on Kevin's lap was taken during her installation in Urbana on January 7, 2009; and also shows Cheryl Carlson, Kevin's aid Francine Biedron, and Carole Field. Thank you, thank you, thank you! Raptor (River x Ramsey) has been certified as a bomb detection K-9 and as a certified patrol K-9, and is very close to being certified in tracking. My husband takes Raptor with him on patrol every day. She is also a great family dog around all the little kids. Thought you would enjoy the attached photos of her. She is the only certified bomb detection K-9 in northern <?xml:namespace prefix = st1 ns = "urn:schemas-microsoft-com:office:smarttags" />Wyoming and southern Montana. Hey Cheryl! I just got this picture of “Uno” (Rush x Dodger) and his officer! I though you might like to see it... I told Lori I would send it as soon I got it. P.S. Any plans of doing a repeat breeding of Rush and Touché??? "Baron", a son of "Timber" and "Venus" has a new career as a narcotics and patrol dog in the state of <?xml:namespace prefix = st1 ns = "urn:schemas-microsoft-com:office:smarttags" />Tennessee! Here he is with his new handler, of Triple Threat K-9. Cher Car Kennels Dutch Shepherd "Diamond" and officer Bruce Poolaw of the Parker, Arizona Police Department pose with her largest dope bust to date.. 328 pounds of Marijuana. This is Officer Jeff Malzhan with K-9 "Jake" (Belgian Malinois). Jeff bought "Jake" as a pup from a nice litter out of Cher Car's Delaney McKee OFA, C.D. H.I.T., by CH Von Krystel's Kody OFA (a Jamie Deux Pottois Sch III, Ring I son). Jeff did all his early training with us here at Cher Car Kennels, and Capital City Dog Sports. For those of you that follow P.S.A., this dog is a full brother to Rakesh Patel's dog "Klaus". "Jake" is a real crowd pleaser in his bitework in the USPCA-United States Police Canine Association trials, as well as scoring very high in both obedience and detection. Jeff writes " Cheryl, Here is Jake�s latest find. I thought you might get a kick out of this - 19 pounds located in the trunk of a car. Exterior hit......"
Cheryl and Deputy Jerry Kast and K-9 "Fritz" now working for the Hillsdale County Sheriff Department. "Here is a photo of Chase's biggest hit to date - thirty pounds of marijuana. The shipment was in the UPS system and heading for Lake City Michigan from Southern Texas. We ended up working the case with the FBI and got federal indictments for the bad guys. The photo was taken while Chase and I were assigned to the Traverse Narcotics Team. You can't really tell from the photo but, Chase let her hair grow a little long for the undercover work. She also wore a Harley Davidson collar to blend in with the bad dogs." Deputy Matt Duff and K-9 "Bolo". Trained and certified by <?xml:namespace prefix = st1 ns = "urn:schemas-microsoft-com:office:smarttags" />Cheryl Carlson and currently working for Hillsdale County Sheriff Department. In his first months as a K-9, "Bolo" has already located narcotics, and found two suspects. "Gunner" is a CH Cher Car's Zodiac son, out of Cher Car's Diego McKee. "Gunner" is the dog of Sergeant Roger Boardman of <?xml:namespace prefix = st1 ns = "urn:schemas-microsoft-com:office:smarttags" />the Hillsdale County Sheriff's Department. This is an Olaf Grandson, working for the Sheriff's department. His handler has the distinction of being the innovator of the "cadaver dog" training. "Well, Cheryl, Argo is doing just great. Working well on his narcotic searches. Also really loves his bite work. Thought I'd send you a couple pics of his full mouth bites� what a boy he is !! This is a pup from the great cross of "Ramsey" and "River". Officer Brathwaite is the head trainer for the <?xml:namespace prefix = st1 ns = "urn:schemas-microsoft-com:office:smarttags" />Detroit Police Department and has his first dog, "Riot" trained as a bomb detection dog. He plans on training puppy "Recon" as a heavy entry dog.